How about a Summer in Geneva? Shashika (second from right) with his supervisor and teammates at the WHO. The skyline of Geneva at sunset. One of my best experiences from the DGHI’s global health master’s program was the time I spent as a fellow in the Duke Global Policy Program in Geneva, Switzerland. If, like me, you have a passion for policy and a burning curiosity about what happens behind the scenes in global health organizations—not to mention an appreciation for chocolate and beautiful landscapes—this is definitely an opportunity to consider. 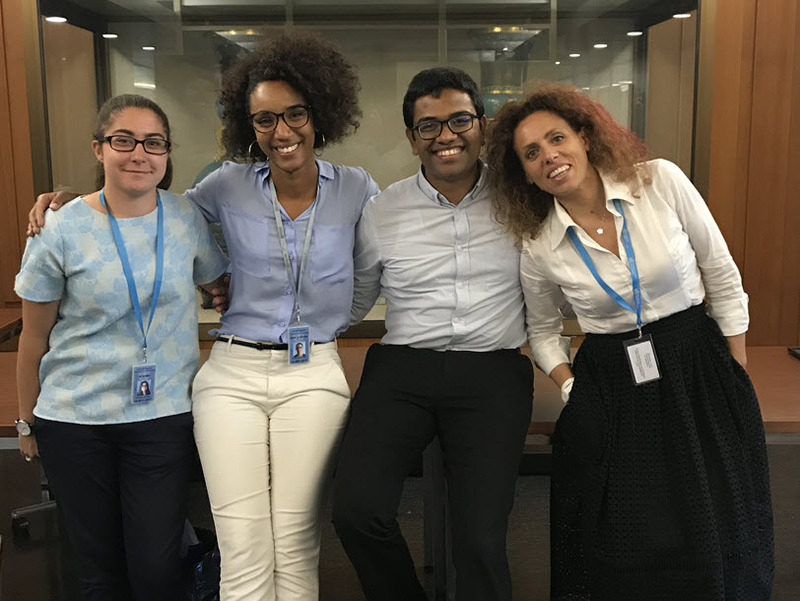 Offered by Duke’s Sanford School of Public Policy, the Duke Global Policy Program (DGP) in Geneva includes an internship coupled with an intensive course week. Even if you’ve arranged your own internship in Geneva or in Europe, you can participate in the course week. As an intern at one of the global institutions based in Geneva—such as WHO, Médecins Sans Frontières or South Center—you’ll gain insight well beyond what you learn in the classroom into how organizations work. You get to see the good and bad and interact with people who are driving change globally in health. As a student, I was lucky enough to couple my thesis research with the internship during my summer in Geneva. While it meant going an extra mile with my work schedule, the results were rewarding. Then there’s the course week. The course week gives you the opportunity to visit with many of the change makers in the field of global health and further learn about ways that you can make your own impact. It also enables you to develop relationships with people at organizations where you might want to work in the future. Visits to organizations, coupled with lectures and panel discussions from experts at the top of their field, were among the most valuable experiences in the program. If you are into global health policy, the Geneva program is an obvious choice. You’ll gain a comprehensive understanding of the real-world applications of global health and the process of how change is made. But even if your global health interests lie more in research than in policy making, the Geneva program could be a good fit, as it gives you an opportunity to witness how research translates into policy at the global level. Gaining this understanding will be key to turning your current and future research work into effective policy. As a fellow, for example, I worked on developing methods to measure access to medicine in WHO member states. I got to work with and learn from people from several different departments and present to key stakeholders within WHO at the end of the program. But every fellow’s experience is different, ranging from publishing reports on timely global health issues to organizing global summits. In addition to the formal aspects of the program, there are other benefits, like getting to know your supervisors, co-workers, co-interns and professionals in other organizations. I learned a lot through my interactions with my colleagues and made some great friends along the way. It was also fun and helpful to talk with new acquaintances and friends about questions such as, “What should I do with my future?” Another aspect of the program that I loved was living in one of the most international cities in the world—Geneva is comprised of roughly 40 percent expats! This, though, is just a fraction of the experience. For example, if you arrive in Geneva in May, you might get to experience the World Health Assembly (WHA). Even if you don’t get to attend this informative event, you may have a chance to expand your horizons by attending other talks, side events, and panel discussions associated with the WHA. The next WHA is scheduled to start in mid-May 2019. Given that the program takes place in the summer, when school is technically not in session, you may want to have some fun—which is easy to come by in Geneva. While I wouldn’t advise going to eat in fancy restaurants unless your wallet is ready for that, I would strongly recommend checking out jazz festivals, taking trips to the outskirts of Geneva and French villages (like Annecy), hanging out at Lake Geneva (Lac Léman) and exploring Europe by taking advantage of cheap air fares. Then there’s the food. If you don’t like cheese and chocolate before you go, you may return to Duke with a new food passion. The Global Health Fellows track of the Duke Global Policy Program (DGP) in Geneva, directed by DGHI professor Gavin Yamey, is a wonderful learning experience and networking opportunity. For me, it was one of the most rewarding experiences. There are also two other tracks focused on environmental policy and humanitarian sector that may be of interest to some global health students. Learn more about the program by visiting the website or attending an information session on Friday, November 2 from 3 to 4 pm in Trent Hall Room 142. Applications for the Summer 2019 program are due December 3.